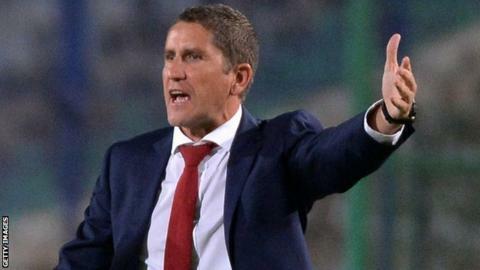 Egyptian champions Al Ahly have sacked coach Juan Carlos Garrido. Ahly said in an official statement that they took action following the club's Champions League exit at the hands of Morocco's Moghreb Tetouan on Saturday. The 46-year-old Spaniard Garrido told his website: "The Al Ahly director of football verbally informed me that I will not be continuing as coach. "I am very disappointed to not be able to conclude this project and to deliver this bad news to you." Garrido was appointed only in July 2014 and steered them to the Egyptian Super Cup and Confederation of African Football Confederation Cup titles in his first season in charge. But he has been under pressure for some time because of the club's league form; they currently occupy third place, 11 points behind leaders Zamalek. Ahly clinched a 37th Premier League title last season and the club's board have been unhappy that the team has not lived up to expectations in this campaign. Then in February, Ahly lost the Super Cup to Algeria's ES Setif on penalties. And after the club lost, again following spot-kicks, to Moghreb Tetouan in the last-16 of Africa's premier club competition, Ahly called time on Garrido's reign.